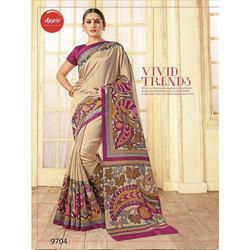 We are engaged in offering Ladies Trendy Saree. We are one of the most reliable companies in this domain and are into offering Designer Saree. Our association is broadly known for maintaining the quality in offering Party Wear Mysore Silk Saree. Sana silk with embroidery blouse heavy Stich.